Show off your pride with this brand new rainbow band pride pen! 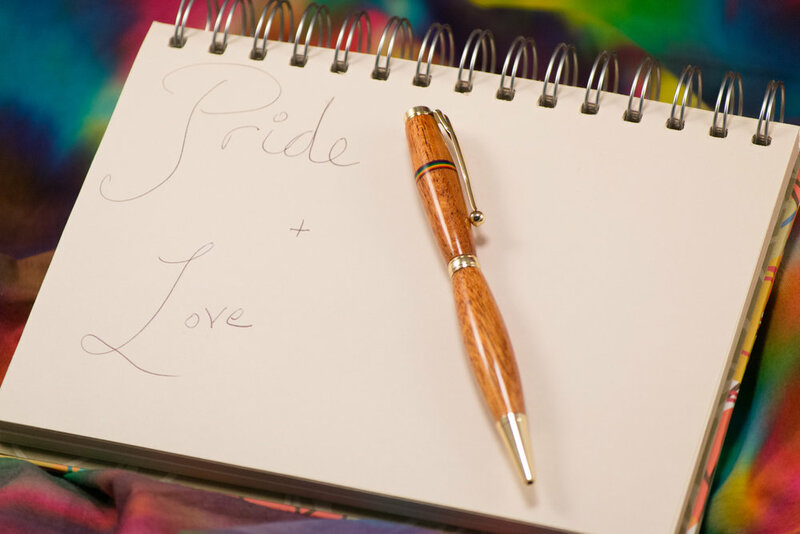 Made from a combination of Mahogany and Rainbow Micarta, this pen is the perfect gift for your significant other or for yourself. It is a twist-style pen, with a stylish gold metal finish on the pen hardware. While I tried to find a rainbow ink tube, I was unfortunately unable, so this pen writes in black ink. Refills are available at most office supply stores, just ask for a "Cross" style ink refill. To protect the wood and to accentuate the golden colors of the mahogany and the brilliant colors of the rainbow band, this pen is finished with a glass-smooth acrylic finish and hand-polished to a dazzling shine. Be proud and fabulous with this pen!